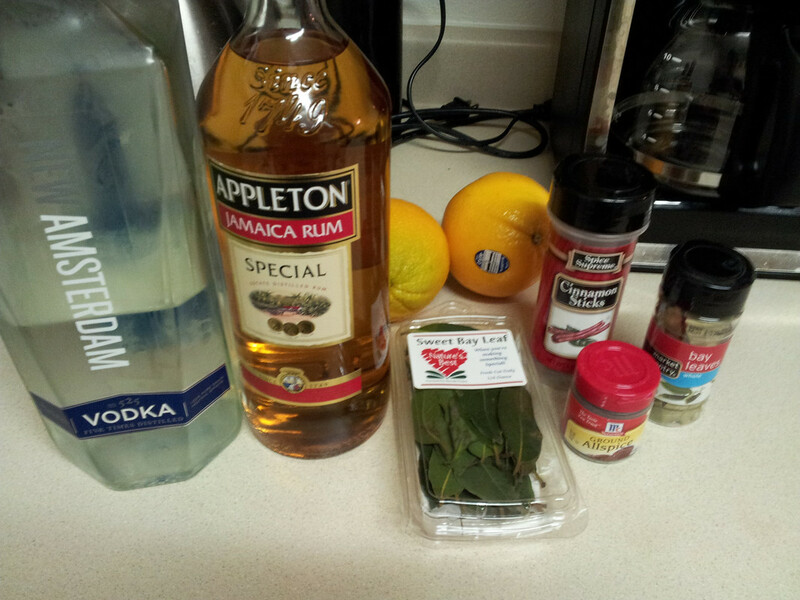 For authentic Bay rum recipes a key ingredient is West Indian Bay leaves (Pimenta racemosa). These are not the regular bay leaves (bay laurel) and are different in both shape and most importantly smell. There are different variants of this tree with variations in scents due to slightly different essential oils in the leaves some have a more cinnamon like smell and some have a more lime/citrus scent naturally. Using the West Indian bay leaves also yields a nice colour as well. These leaves are difficult to find but I know of a place where you can get 'em if you are ever interested in trying them out. (08-03-2012, 09:22 AM)CaliforniaCajun Wrote: Don't give this man a sample. Seriously, this sounds very interesting. By all means never give him a sample. One question how drink able is this stuff and is it flammable? Sounds like a fun experiment! Well I'm gonna have'ta try my hand at this. I'll bet it smells great, and I think a bit of witch hazel and glycerin, like wingdo said, would be good, too. I will try this thank you. I must buy the rum and oranges but have the vodka and spice in my hands now. But I must buy the right bay oil where? Great idea, I think that I will try to mix a batch. This sounds like good stuff. I have read that a lot of guys don't like the cloves at all, or nearly as strong as many commercial products present it. Great post. 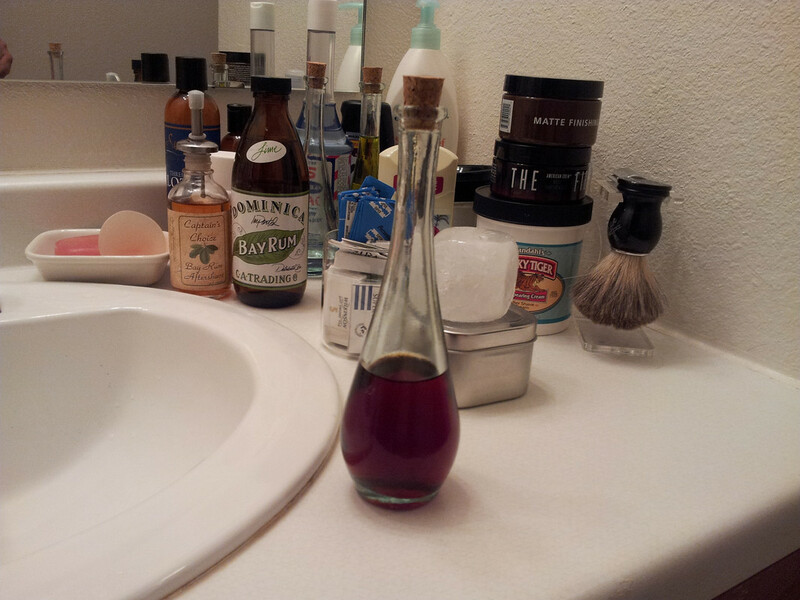 I've been making various bay rums along with perfumes some years now. Any spoilage issues using fresh ingredients? I've had issues with that, and retaining the oils of the botanical s using a fresh materials method. I wish I knew how Shillingford, etc. did there's. Essential oil will dissolve in a 100 alcohol solution, but then when brought to the circa 15 percent recommended, becomes oil separate from the solution again. Any comments? I saw a mention of essential oil, which is alot less work than mixing botanical bits. Seems industry still has some secrets. (01-09-2015, 02:44 AM)stephengilley Wrote: I will try this thank you. I must buy the rum and oranges but have the vodka and spice in my hands now. But I must buy the right bay oil where? (05-07-2015, 11:24 AM)Frodo Baggins Wrote: Great post. I've been making various bay rums along with perfumes some years now. Any spoilage issues using fresh ingredients? I've had issues with that, and retaining the oils of the botanical s using a fresh materials method. I wish I knew how Shillingford, etc. did there's. Essential oil will dissolve in a 100 alcohol solution, but then when brought to the circa 15 percent recommended, becomes oil separate from the solution again. Sounds like you need to use some kind of emulsifier but I do not know what a good one would be. Go to wickedrascalgroomingco@gmail.com Tell them Dave Huffman sent you! Mix all ingredients, let sit for two weeks out of light in warm environment in a sealed glass container. 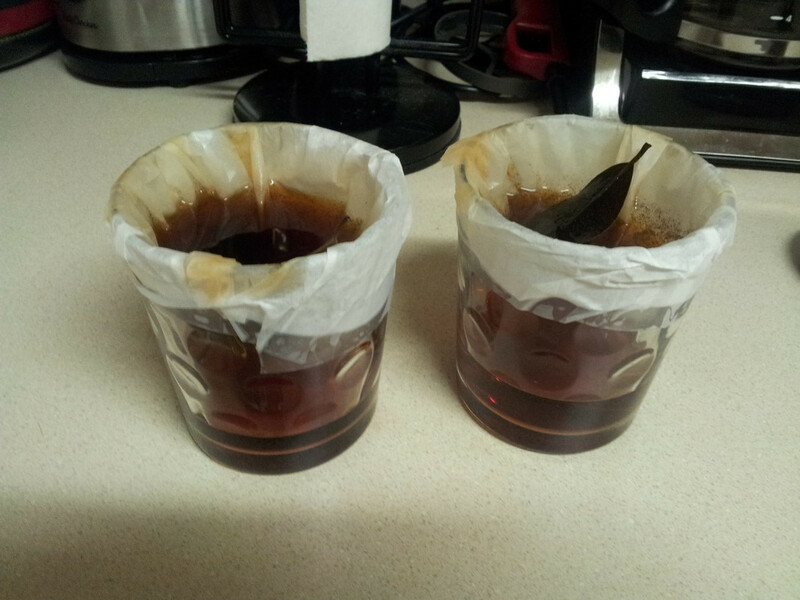 At the end of two weeks, strain through a coffee filter. 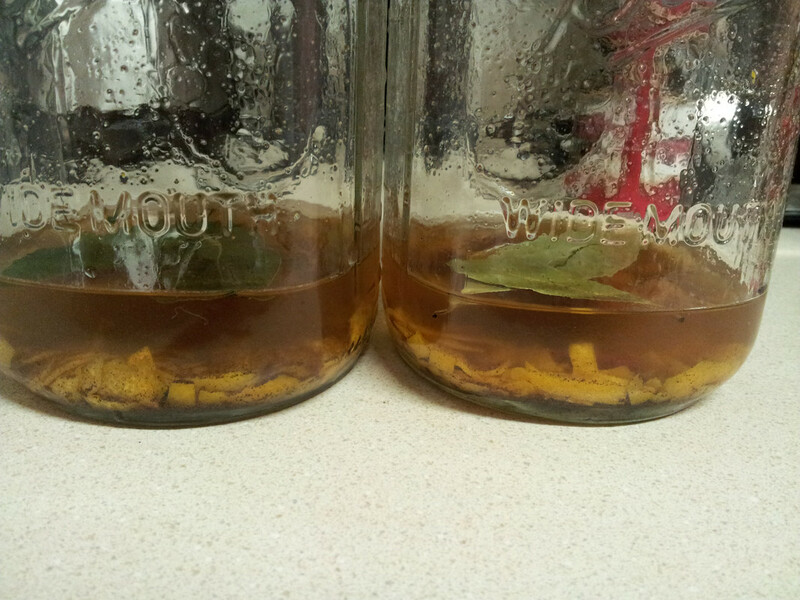 Note: I wasn't sure if there would be a difference between dried bay leaves and fresh bay leaves, so I went ahead and made separate batches, one with dried, one with fresh. 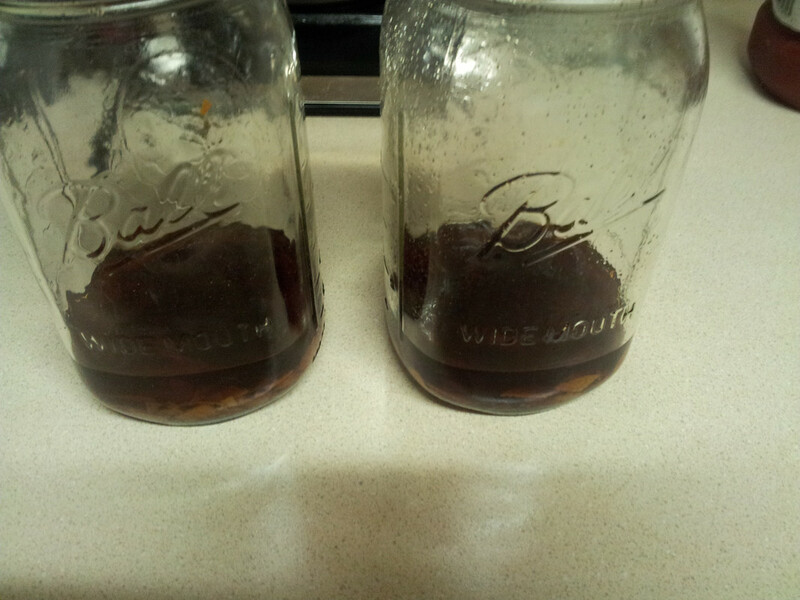 It should also be noted that I used ground allspice. Each batch produced just over 100mL. I'm not very good at describing smells, but the orange definitely over-powers this scent, with the spiciness as an afterthought. Pictured below is the fresh leaf batch, which I will be trying out tomorrow after I shave. 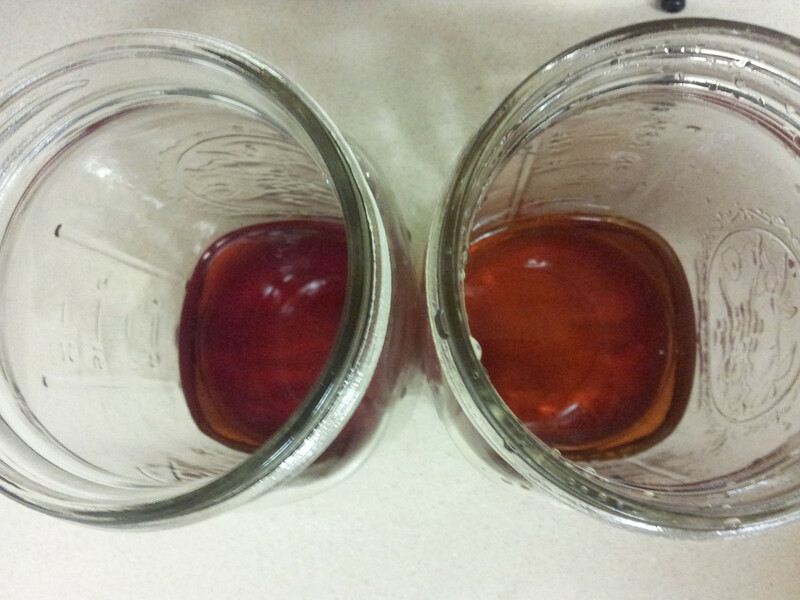 I plan on trying both batches as they are, and both batches with glycerine in them, comparing differences between the two and will update this post when complete. For future batches, I would like to substitute lime for the orange, make a batch with no fruit, and make a batch with a pinch of pipe tobacco, at the suggestion of others. One thing to look for in making this is that the rum you choose has real cane sugar and not some chemical stuff.